Hawkman is not high art by any stretch, but it's a better book from Liefeld and company than Grifter was. At thirteen issues for twenty dollars, it's a thick book with a lot of value for your dollar, at least in terms of story pages (when something isn't good, the sheer fact of their being a lot of it sometimes mitigates this, for better or worse). The absolute star of the book and its perhaps most redeeming factor is that artist Joe Bennett draws nearly the entire trade -- I previously enjoyed his work on Teen Titans and Geoff Johns's Hawkman, among others, and his presence both gives the book a legitimacy and also mitigates some of the hokier writing. Writers Liefeld, Mark Poulton, and Frank Tieri do well enough by Hawkman -- at least, also better than the first volume of Savage Hawkman -- and the book only really, truly starts to go to shreds in the final issues by Tom DeFalco. Once it finally gets going, Liefeld and company's section of the book (nine of the thirteen issues) involves Hawkman Katar Hol, nee Carter Hall, trying to escape militant Thangarians who want to take his Nth metal armor and arrest him for treason. One of these is Shayera Thal, the pre-Flashpoint Hawkgirl/Hawkwoman; the "Hawkman: Wanted" storyline also sees Hawkman teaming with Green Arrow and Deathstroke (and appearing in their titles, though those issues are not included here). Altogether that's not a terrible story premise, and indeed it's the kind of crossover story one might imagine Chuck Dixon writing in the late 1990s, a la "Brotherhood of the Fist." 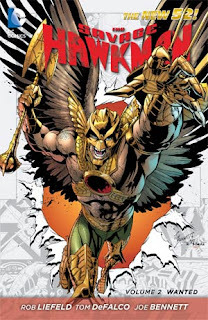 What I appreciated about the story is that the writers do try to tie Hawkman's newly revealed (though inevitable) Thanagarian origins to the first Savage Hawkman volume, in which a seemingly human Carter Hall tried to burn his Hawkman costume (a reference, I think, to the events of Brightest Day, in that confused period where what was and wasn't canon in the New 52 was still in flux). The amnesia story doesn't coincide completely, but well enough, and there's good precedent for Katar-as-Thanagarian-rebel. Also Emma Ziegler and her father still appear in this book, following from the previous volume; though Emma's personality might be slightly different here, I liked that the new team preserved the old supporting cast instead of jettisoning them entirely. There's also connections made to the ongoing Daemonite storyline, short-lived as it was. Most of the story is taken up with Hawkman slashing and beating his way through his enemies, which is enjoyable enough as drawn by Bennett, even if many of the bad guys are too-heavily 1990s-influenced. It's hard to take seriously Hawkman and Green Arrow as friends (let alone Hawkman's team-up with Deathstroke), but at the same time there's always a thrill in seeing these characters on the same page. There's good "space flick" atmosphere to the climax aboard a Thanagarian ship; nothing ground-breaking, but enough good reversals here to make for a readable story. Also Carter's archeology background (fake as it turns out to be) comes more into play here; this feels like a more Hawkman-specific story than the last volume. This is not to suggest perfection by any means. The heavy-handed 1990s influences show throughout this book, but especially in the nonsensical second chapter, where Carter and Emma visit a "trusted" priest for help translating an artifact; almost no sooner do they enter than the priest turns on them and summons a ridiculous-looking, medival-style assassin called St. Bastion, whom the priest just happened to have on hand, to attack them. That the incident, priest and all, is never referenced again suggests maybe the creative team smelled a stinker, too. The whole book is heavily over-narrated, with the narration describing actions that are clear from the panels -- and in the third chapter, villain Pike even tells Hawkman "quit with the internal monologue," a truly absurd piece of dialogue. The end of this storyline is complete though feels a bit rushed, perhaps due to Liefeld's departure, and a handful of switches between Bennett and other artists grate. Tom DeFalco's final four issues do have going for them that they introduce two classic DC Comics villains, Shadow Thief and Blockbuster. There's nicely sketched-looking pencils and inks by Fabrizio Fiorentino for the Thief's "shadow dimension." I initially thought DeFalco's Blockbuster story was especially notable because of a twist in Blockbuster's classic identity, but DeFalco goes the traditional route in the end. The villains, however, don't make up for four issues with a lot of problems. Narration and art often don't match (Emma's eyes are said to "flare with concern" while in the panel she looks absolutely joyous). There's some clumsy use of thought balloons, which stand out because they're mainly used for just one single issue. DeFalco introduces a tired plotline in which Emma feuds with Carter because he's spending more time as Hawkman than with her, making Emma the kind of "nagging girlfriend" character that I had hoped comics was done with. Emma's father has Alzheimer's, and DeFalco gives his dialogue an "Ahhh" tic within sentences every time Zeigler speaks, which is both annoying and I think probably not factual. DeFalco also offers a rendition of Hawkman's origin that, while workable, doesn't quite seem to jibe with what's established earlier in the book. DeFalco also gets the task of closing up the book, presumably with orders to lead it in to the new Justice League of America title. We can't blame the brusqueness of the end on DeFalco entirely, but unfortunately separating this book from what comes next involves tossing Emma to the curb. I doubt anyone was all that invested in their relationship, but it's unfortunate that what was at least a mildly viable comics relationship set up at the beginning of this book ends on such a trite note. Also Geoff Johns's Hawkman origin in JLA differs too from what we see in Hawkman, forcing DeFalco to do some awkward tap dancing to make it all make sense. Coming up -- continuing with the "Hawkman: Wanted" tie-ins with Green Arrow Vol. 3: Harrow.